Here are some of our favorite, simple and very delicious grassfed beef recipes. We’ve collected many more recipes on our Pinterest board, Certified Grassfed Beef. Heat oil in skillet and saute shallots until lightly browned over med-hi. Add thyme, salt, peppers and mushrooms. Saute 6 min and add garlic, saute 2 minutes. Stir in wine and soy sauce and cook 15 sec until liquid almost evaporates. Stir in parsley, cover and set aside. Sprinkle steaks with a little salt and pepper. If using a grill pan, coat with cooking spray and cook steaks 3 min on each side over med-hi heat or until desired doneness, although we love them best on the grill. Let stand 5 minutes and serve with the mushroom mixture. Beef broth – about 2 cups – homemade is best! Or can use water. Preheat oven to 300. Salt and pepper the short ribs and brown all sides in a skillet preheated over med-hi heat, or sometimes I sear them on the grill! Place short ribs in a 9×13 glass baking dish and add the red wine, broth, garlic cloves and veggies. Cover with foil and bake 3-4 hours until very tender. They will just fall apart when you pierce with a fork. Serve over mashed potatoes, grits or make a sandwich! She always made this roast for special occasions, and we always requested it for our birthday meal! One of the easiest roast recipes, and my favorite. 8-16 oz organic beef broth depending on the size of your crock pot – homemade beef broth is best, or can use water. Salt and pepper the roast. Brown at med-hi heat on all sides (sometimes I do this on the grill). Put the roast in a crock pot with the beer and beef broth, half a jar of pepperoncini peppers, garlic cloves OR a couple shakes of garlic powder, some oregano and salt & pepper to taste. Add enough water to nearly cover and cook all day (8 hrs) until it falls apart when forked. Serve with crusty bread for sandwiches, & au jus on the side for dipping. Beef Kaftas with Homemade Horseradish Cream – a delicious way to use ground beef and the grill! Traditionally I think these have cinnamon, cumin and more exotic spices but I like to use my homemade smoked paprika and chipotle in everything. Combine all ingredients except ground beef. Add beef to mixture and mix very well. Refrigerate for at least 30 minutes then grill til done. 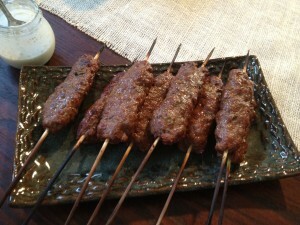 If using wood skewers, soak them in water for 30 minutes before skewering meat so they don’t burn. Let kaftas rest a few minutes before serving. To prepare homemade horseradish cream, wash root and scrape clean with knife. Grate with fine microplane grater into jar, wait 6 minutes then add small amt of white wine vinegar and few pinches of salt, to taste. Stir into sour cream or mayonnaise to desired taste. Serve alongside kaftas for dipping. combine all in lg bowl using bare hands to ensure it is mixed well. Form a small patty and quick fry to test seasoning. Adjust seasoning to your liking. Refrigerate for 2 hrs to allow favors to blend. Form into patties or package it in bulk. It can be used immediately or frozen with waxed paper between patties for easy use. Frozen patties can be put straight into frying pan.